I was not sure what to expect from the writing studies program or this class. I entered into the semester hoping that this program would help me create a bridge between my prior work experience in theater and the creative arts and my potential future work possibilities. I was not sure what that meant but was open to the search. I didn’t expect to find so much so fast. I am pleased to be in a program where writing is the practice and the topic of discussion. It is exciting, demanding and inspiring. We have finally made it to the finish line of the semester in Writing Theory & Practice class. Our final class is next Monday. I am excited for you to complete your final class project. The concept of “Small Bites of Knowledge” is a provocative (and novel) way to explore the process of writing. I am sure this collaboration will be well worth the effort, and I plan to share it with the Equity Unbound network, as should each of you! 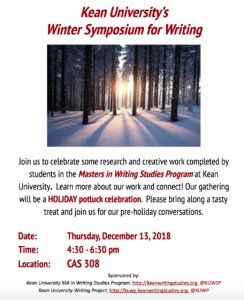 In addition, I hope your final work will be featured in Kean’s Spring research form entitled “Research Days 2019“. There is no more blogging (phew). Your weekly blog now represent a significant part of your portfolio for the course! -Make sure you have all of the “vignette” content completed (for each theme). That means you should each complete your five vignettes needed. You might consider using the Peer Review Protocol which provides a few questions to consider as you complete your own work. And you can keep these questions in mind as you consult your colleagues on Monday regarding your contributions. -In addition to the five final vignettes from each of you, make sure you have a short bio (2-3 sentence) handy for inclusion in Small Bites of Knowledge. I think the sire should reference who you are as authors and collaborators. -Also, anticipate the necessity of some kind of “cover page” which describes the context and purpose of the site. This is something you might want to work on together Monday night. Think brief “mission statement” or “statement of purpose”. Or it can come across as a description of the collaboration and your hope for your readers in engaging the content. I imagine this statement or description will be a critical component of pulling the project together in a cohesive way. 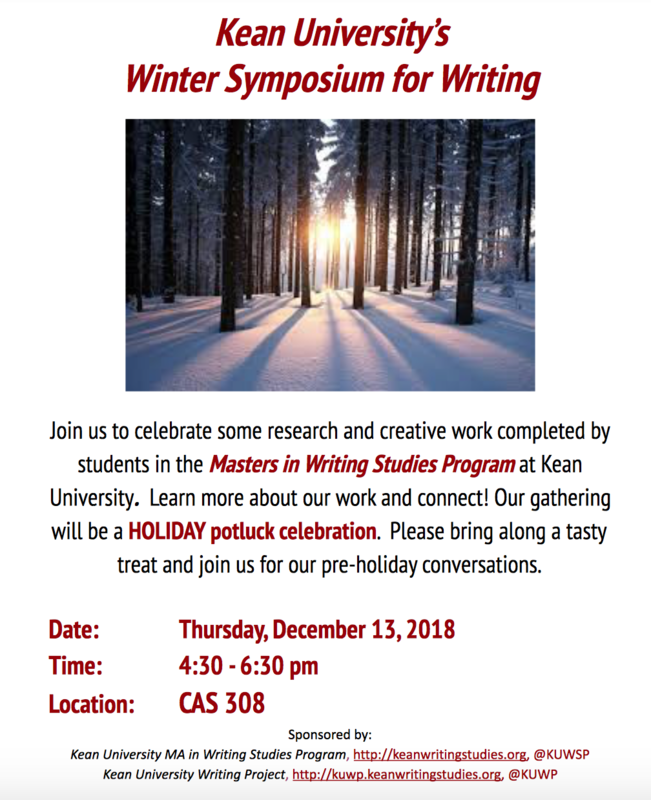 ***You are all encouraged to attend the Winter Symposium on Dec. 13th (Thursday) at 4:30pm in CAS 329. This will be our opportunity to celebrate and acknowledge the holiday season together as a small but special community. Finally, please submit your final self-assessment portfolio & narrative to me via email by Monday, Dec. 17th. Thanks for a great semester. I have enjoyed getting to know each of you. It has been my sincere pleasure to read your reflections each week and I have looked forward to our insightful conversations. And I can’t believe how it just flew by…. Using rubrics for writing assignments is something that often ends up being a topic of discussion. Although I might agree with their potential of improving the overall assignment, their efficiency is still something that I need to observe first-hand. Throughout my four-year undergraduate student life, I only had to use a rubric twice. I believe I lost both of those rubrics before completing the assignment. Looking back, I’m not absolutely certain of the degree they could have altered the outcome. Hence, I personally neglected of using a rubric in my own classes. Though, after reading the article, Using Rubrics to Develop and Apply Grading Criteria by John Bean, I might have developed an interest in designing rubrics to utilize for future writing assignments. Since I have a presentation based on that particular article and I need to hand in a print-out, I do not find it necessary to copy and paste my analysis here. I have learned a lot of things about the nature of rubrics from the article. Some of them are very intriguing. I’m interested in finding out what others think about utilizing rubrics in the class. Perhaps even certain details about rubrics that are not touched upon in the article but stemmed from personal experiences could be brought up. I think it will an interesting discussion. I was unable to attend the last week’s class and receive any pointers as to how to revise my piece. So, I simply added couple of paragraphs to the end. Due to amount of final assignments and other responsibilities, my contribution for this particular assignment this week is extremely limited. I’m little behind at the moment but I’m hoping that I can pick up the pace for next week. There is also the bias that comes with the common truth. A study of behavior based on common interests display the innate favoritism that people possess. We are drawn toward aspects and notions that are in common with our own personal interests. A person who might be considered shady or criminal could easily become someone we wish to befriend simply because he or she also enjoys the same brand of candy as we do. Turning a blind eye tends to be a common occurrence in the presence of common interest. This natural behavior is encouraged greatly on social media. Or like. The middle of the end. It’s not the end of the end yet, because I’m still stressed and staring at a laundry list of things to do in my phone’s notes app. I technically have, like, 3 notes apps. I’m not gonna ponder the ridiculousness of that for much longer because I’m just gonna end up staring into space and will probably freak out my parents. We’ve got like 2 weeks left, kinda. Man, idk. Time isn’t real. It kinda helps to pull back and look at things objectively–to see that there’s only 3 projects that I’m working on, and that I’m technically done with most of one of them. I spent the majority of this weekend working on the one for E-Lit. That’s… I’m excited for it, but also it’s going to be horrendously unfinished with just the main storyline fleshed out and a taste of the type choice/perspective-swapping shenanigans I had in mind for it. More on that in The Other Blog, which most of you pretty much know about. I am too tired to link but it’s masoochwrites. If there’s still no link there as you’re reading this, I forgot. If there is, ayyyyyy rad. Voice in writing is a topic I didn’t know I’d become so invested in, particularly over the the last few months. I didn’t even know it was a thing that was studied in writing theory until I took my Writing Theory & Practice course (for which this lovely project you are currently viewing has been made). In the past, I thought it was a thing writers just… did. Putting their own spin, their own personality, into their work. So… that’s what I just… did. I’ve been told that I’m good at it (I’m really really trying not to like, toot my own horn here, really), and I suppose it’s because I try not to have a filter between my head and the page. I write how I speak, how I think–grammar be damned, in certain circumstances–and… apparently it comes out as… genuine? Colorful? Personable? I dunno, I can’t judge my own writing accurately. I don’t think anyone can. So, anyway, it saddens me when I read theoretic works discussing past discourse about voice. How a person’s “voice” when they write is not actually them. How it goes through societal filters, pandering to an audience. But… should that make a person’s words any less genuine? The environmental factors? A quote from Peter Elbow from one of our readings, “Voices in Writing” really stuck with me regarding the concept of voice, and the fear we have about singing our notes, to use Elbow’s language. I understand the need for separating the academic voice from the informal voice, the need to have more than one voice in writing. What I don’t understand is the believe that either are automatically viewed as an act. I could be wrong. There are probably people out there who fake it ‘til they make it, but like… is that “fake” voice still not undoubtedly theirs? Oof, okay, that’s getting a little deep, even for me. Let’s tone it down. Please pick a topic. Something you’re passionate about and could go on and on about. I want you to record yourself speaking about this topic for anywhere from 30 seconds to 1 minute. Then, afterwards, transcribe your little rant. Grammar mistakes, colloquialisms, filler words and sounds and all. Write it down exactly as you spoke it. A complete transcription. I feel like Vee’s is somewhat similar to mine, just from a different perspective. I think I’ll discuss the stigma against English dialects that aren’t “proper American English” as well as “accented English” (and how the stigma is bs, of course). I belieeeeeeeeve I wrote a blog post on the latter, so catch me referencing that. Go off about teaching and the passion educators have to possess. ((Which I unfortunately do not have. I’ll probably tell my student teaching story.)) Discuss concepts I remember from when I was an education major, including mock lesson plans I had to do. Rant about news media sites and how the right phrasing can completely twist a story. I have some sites in mind to call out y’all I’m ready to spill some tea. Edit part of a piece of mine from the past. Talk about the strategies I use for peer reviewing in the writing center as well as editing in general. I’m aware that I’m pretty behind in the drafts for these, and I plan on having them Ready To Go in the next few days. As such, I apologize for my behind-ness. I’ll also make a note here that along with these vignettes, I need to write up a mini bio and record myself for my own vignette. … Y’all know that meme of the dog sitting at the table in a burning house saying “This is fine”? Before I go, this week we had a bunch of readings to go through. I’ll admit that I didn’t get to go through them as thoroughly as I would have liked, but Nancy Sommers’ “Responding to Student Writing,” a topic which I am very familiar with (I was going to link a past blog post here that I relate to it but that’s like… 4 blog posts). Sommers talks about the difficulties and complexities in responding to student writing. As a teacher, you have to have a balance between editor and instructor. Tutors have to have this balance, as well, but it’s more like a balance between teacher and peer. As a tutor myself, it’s generally tough to figure out which role to take on in a particular session. But anyway, a lot of the time, professor comments are what we focus on, and it’s the top priority to help the student understand what it is the professor wants and to help the student follow their guidelines. I look forward to discussing the articles for this week in class. I’m gonna scoot for now so I can get working on those finals. I found all three essays interesting for different reasons, but have chosen to comment on the work by Nancy Sommers. I appreciate the opportunity to read a second essay by Sommers. In Responding to Student Writers, Nancy Sommers addresses the relationship of teacher to student in a way that asks several fundamental questions. Why do we comment on student papers? What is the most effective way of moving students toward progress? How do we help students internalize the questioning reader? What determines which of the comments the students will use or ignore when revising? This essay was a terrific follow up to Revision Strategies of Student Writers and Experienced Adult Writers, in which Sommers presented the divide between student writers and experienced writers in understanding revision. I came away from that reading with the impression that part of that divide is a developmental capability of a student that evolves with age and transforms into the mature executive functioning of an adult with experience. The essay this week, Responding to Student Writers, broadened my understanding of Sommers research and work. In many cases, the lack of understanding by students is enhanced by teachers rather than resolved. The question of why teachers comment on student’s papers seemed obvious and pointless. However, the material that was presented by Sommers illustrated its necessity. The lack of understanding in students is often intensified by the misdirected efforts of the teacher’s comments. Ultimately, teachers comment on papers with the intention of moving students toward progress. In many cases, the attempt to do so is all over the place. Messages of grammatical, structural errors, often contradict a request for clarity, development, and refinement of voice and argument. I found the research interesting that questioned which of the comments the students will use or ignore when revising. It was particularly disturbing that there was often hostility detected in the comments. It was startling that the software, Writer’s Workbench, was more supportive of student writers solely because of its consistency and lack of emotion. “The calm, reasonable language of the computer provided quite a contrast to the hostility and mean-spiritedness of most of the teachers’ comments (P149).” Sommers clarifies that accidents of discourse have no place in the early sequence and that comments in these areas early on create contradiction and confusion. She cited some helpful examples of contradictory information in the comments: “edit but expand.” Although well intended, these comments inspire inertia and do not give a roadmap for how to proceed through the revision process. In the last essay, Revision Strategies of Student Writers and Experienced Adult Writers, Sommers stressed the importance of the recursive shaping of thought through writing. Fundamentally repetition is a part of the process she lays out. I believe that the burden here rests on the teacher to make a clear and non-emotional structure which is loose enough for each time of student to practice repetition and lots of it. I also thought it was essential to address that the teacher can confuse the student’s purpose. “Teachers’ comments can take students’ attention away from their purposes in writing a particular text and focus that attention on the teachers’ purpose in commenting(p151).” Students make the changes the teacher wants as opposed to excavating their clarity. Also, the comments are also generic and vague. “We have observed an overwhelming similarity in the generalities and abstract commands given to students. The accepted, albeit unwritten cannon for comment. Uniform code of commands, requests, and pleading. Students have trouble with the vague directives. Revising becomes a guessing game.” For example, “choose precise language.” What does that mean? This is compounded by not being offered any strategies for doing so. (P153) There is no connection with the mentor and no reciprocal motivation. I believe that motivation is often generated in the exchange between teacher and student. This requires a skilled structure that provides the necessary guided repetition that leads to the recursive shaping of thought through writing. I have been working on a structure that is very rough at the moment, but I am going to include it here as a reminder to revisit it in the future. Part of it is included in my vignette entry for my theme in our “Small Bites of Knowledge” project. Column 1: the skills that require the repetition of drilling (grammar, spelling & punctuation) Requires objective drills and non-emotional redirection (Sommers study with Writer’s Workbench) Focus on making a skill repeatable. The practice of what it means to choose precise and concise language.) give the variation on the two groups snow photo. Column 2: Language of an argument. Repetition of craft. More space around this than the drill. What do you mean? The listener gets to ask questions. The writer gets to write their answers. How do we create engaging activities that make this skill repeatable? Mentorship required. Sometimes peer review is pointless depending on the pairing. All three columns can be worked on simultaneously. Differs from the linear view. It is a horizontal spread. Or perhaps like a snowflake. In her article Responding to Student Writers university professor, Nancy Sommers discusses the topic of teachers responding to student papers. In the beginning, she explains that this process is time-consuming and ineffective. While it is the most significant part of a teachers job research has shown that this action has little to do with student success in writing and the process overall is misunderstood. This misunderstanding is the main focus of her article. Sommers writes that teachers comment on student papers for two main reasons. With these two reasons in mind, it is important to know that teachers commenting on student papers is a well-intended practice necessary to create great writers. Often times students believe that their writing communicates well to the reader in sound reasoning and logic, however, it is not always the case. So it is important as teachers to make those comments on student papers so that they will write more effectively, stick to the topic and have an intelligible paper overall. Even so, Sommers argues that the way teachers comment on student papers is vague and lack direction. In order to prove the vagueness and ineffectiveness of teacher comments, Sommers mentions a scientific research conducted by her and several other professional colleagues. In the study, a total of thirty-five different teachers at New York University and the University of Oklahoma commented on a set of three student essays. The result of this research shows that when students received comments and feedback on their papers, they were confused and left to question the ways to best improve their papers. Additionally, she makes a comparison between teacher comments and a computer software ready-made comment for student papers and concludes that unlike teacher comments “the calm, reasonable language of the computer provided quite a contrast to the hostility and mean-spiritedness of most of the teachers’ comments” (pg.149). In essence, teacher comments are not properly communicating ways for students to edit their papers. Additionally, she presents two different set of teacher feedbacks to show how teacher comments can be difficult for students to understand. These different comments are interlinear and marginal. “The interlinear comments and the marginal comments represent two separate tasks for this student” (pg.151). The interlinear comments: encourage the student to see the text as a fixed piece, frozen in time, that just needs some editing. The marginal comments: suggest that the meaning of the text is not fixed, but rather that the student still needs to develop the meaning by doing some more research. Another type of comment she mentions that teachers often write on student papers is the “rubber-stamped” ( pg.152) type of comment. In the second writing example, she shows how a teacher comments are not texted specific and could be interchangeable. This means that because of its vagueness and lack of specificity these same comments can be made and applied to any student paper. These types of comments are not encouraging for students and often times creates a more problematic step in the revision process. I agree with Sommers argument that these forms of comments are hindering student success because then they become more worried about correcting the teacher’s feedback on their paper instead of confidently writing in their own voice. The student is more concerned about getting a good grade overall on the paper. “It is possible, and it quite often happens, that students follow every comment and fix their texts appropriately as requested, but their texts are not improved substantially, or, even worse, their revised drafts are inferior to their previous drafts” (pg. 151). After making these key points and further elaborating in details, Sommers suggest that for teachers to have a more effective influence on student writing, they need to take into consideration that the draft is not the final copy. Meaning, that over time students will continue to work on their papers. I liked that Sommers brought this up for clarification, I agree that often times teachers fail to keep in mind that the final draft is just an accumulation of ideas and thoughts for the paper. There is no need to comment on student grammar or spelling and other such little errors that can easily get fixed in the revision process. Instead, teachers should comment on the formatting and meaning of the text because those are the most imperative aspects of a paper. Asking students to “be more specific” is not required because there are more steps to complete in order to fully formulate thoughts and ideas in a paper. show students how to patch up parts of their texts, instead of finding errors (pg. 154). Overall her article makes great points about teachers commenting on student papers. One reflection that stood out to me was her making a distinction between the process and the final product. She mentions that another way to fix the ineffective problem of teachers commenting on student papers is for teachers to differentiate between a draft and the final paper. She writes, “The problem here is a confusion of process and product; what one has to say about the process is different from what one has to say about the product” (pg.154). She concludes her article with this point and I believe that when teachers read this article and take this advice into consideration they will become better at responding to student papers. What happened when you used your coloring for inspiration? How can you use these emotions in your writing? Do you think students should have access to more activities that spark creativity? Going forward, what activities will you do to spark enthusiasm in your writing? Serken: What makes someone believable? Is it the color they are wearing or the way they speak? Living in the age of technology where anyone can be anybody or say something, we (the general population) believes it is true. There are three images that made me think about how fake news can cause uncertainty and an overwhelming amount of anxiety. There seems to be a rapid force of fake news that can’t stop, which is dangerous for the up and coming generation. Christina: Activity: Let’s Play a Game! Did you feel comfortable writing the paragraph in your own voice? Did you feel comfortable writing the paragraph in your academic voice? Do you wish you could write in your own voice more? Finally, do you feel as if you, as a student, are offered many opportunities in the classroom do write in your own voice? Should you be allowed those opportunities? And do you think that will help or hurt your academic writing? Teachers just need to be reminded of how to properly comment on a student’s paper. Teachers comments can take students’ attention away from their own purposes in writing a particular text and focus that attention on the teachers’ purpose in commenting. Most teachers’ comments are not text-specific and could be interchanged, rubber-stamped, from text to text. Our comments need to be suited to the draft we are reading (154). The key to successful commenting is to have what is said in the comments and what is done in the classroom mutually reinforce and enrich each other (154). The image below: From theory to practice. Vee: The use of language in the normal American classroom setting is more complicated then it seems to be. I have a strong passion for students who have an unfair disadvantage in the classroom from any circumstance. Paul Kei Matsuda, the author of the article “Teaching Composition in the Multilingual World: Second Language Writing in Composition Studies” (https://drive.google.com/drive/folders/0B5–sMS-4u43fnFiOHBMVzJjSW1lLVJDN3V3YXVIcXZzNmstdUxNXzQ5eWl2SUlQVVo3NVE). There is a growing population of second language speakers and writers in the U.S. Unfortunately, there are not enough classes being brought into the education system to help these second language writers grow to their full potential. This issue has been overlooked many times, and I can say personally because it has happened to me. Before I discuss that more in depth, there were two main points to the importance of this article that Matsuda brings up. Matsuda also gives two reasons as to why there is a lack of attention to these language issues, and that would be the “disciplinary division of labor” and the “myth of linguistic homogeneity.” The last important point that he talks about is how globalization, (global integration of international trade, investments, information, technology, and cultures), is a critical factor that connects to teaching second language writing. Globalization could be used to teach writing in various fields such as professional or civic that expands beyond academic writing. That is important because second language writing can be taught passed the U.S. and should be international, which Matsuda discusses later in his article. “A Different World” is a television show from the 80s and early 90s about college students who attend Hillman College, which is an HBCU (Historical Black College/University). One of the characters from the show, Lena James, speaks “African American Vernacular” and had trouble understanding “Romeo and Juliet” by Shakespeare in her First-Year English class. Until she realized, it was all about translation. In the clip above, she was able to take an English language and translate it into another form of English, one of which is her native language. This all ties into what Matsuda said about translation. He states, “The use of translation is also a possible resource for second language writers; although the effectiveness of translation as a writing strategy can vary depending on the writer’s second language proficiency level (Kobayashi and Rinnert), it can allow second language writers to tap into the knowledge base they have already developed in another language” (40). Another main issue that second language writers have is that they have limited exposure to what is considered the correct use of the English language and formal written English, which means that it is harder for them to develop their writing proficiency in U.S. English compared to people who grew up learning the U.S. formal English. Although having these lack of resources is one of the cons that second language writers have, they also have a pro. “Others suggest that second language writers may have expanded their intellectual capacity as a result of the constant demand of working with a broader range of linguistic and discursive resources” (Matsuda, 40). An interesting point that Matsuda brought up that I never thought about before is the level of difficulty bringing this issue to the classroom is because of the teachers. The teacher should have a balanced knowledge of English and second language writers, which many teachers don’t have. Besides globalization, internationalization is a crucial key factor in bringing this issue to our education system. Internationalization, however, requires the need to travel to other countries and then come back to the U.S. and share their research with their fellow scholars. I believe everyone should study abroad or travel if you are going to become a teacher, professor, or scholar. When I studied abroad when I came back to the U.S. my thinking and knowledge towards my education and other college students expanded. Matsuda has a suggestion as to how to internationalize the field, “U.S. composition specialists need to learn more about sociolinguistic and institutional contexts of other countries. Before trying to reach out to others, however, U.S. composition studies many need to come to terms with the issues of globalization and multilingualism within its own institutional contexts” (Matsuda, 51). I hope that anyone who read this article was able to learn something new about second language writing and the effect it has on students and teachers. Purpose: Help instructors articulate their expectations for papers early on and to determine their grading standards in advance of an assignment. Rubrics. Rubrics is something that I have never “liked.” In my honest opinion, I never found it helpful or useful. Using a red pen to make giant circles around numbers with vague descriptions in each category that determines my grade has always been a puzzle to me. I do understand that a rubric is more of a guide for teachers to stay organized and give fair grades to their students. Author of this article, John C. Bean, gives a more clear reasoning as to why teachers use rubrics. Bean suggests the idea of planning grading criteria along with communicating the criteria clearly to the students, then there will be a better chance of coaching, commenting, and aiding papers. Also, Bean described the various types of rubrics, which is something I thought was interesting. (All information provided from Bean, 270-276). Analytic vs. Holistic: The analytical method gives separate scores for each criterion, for example, ideas, organization, use of evidence, attention to alternative views, sentence structure-whereas the holistic method gives one score that reflects the reader’s overall impression of the paper, considering all criteria at once. Generic vs. Task-Specific: Generic rubrics follow one-size-fits-all designs, aimed for use across a variety of writing tasks. As much as possible they try to be universal. In contrast, task-specific rubrics are designed to fit an individual assignment or genre. Different Methods of Describing Performance Levels: The most common approach gradually ‘steps down’ the descriptors from level to level (in this case, six levels) to indicate different degrees of performance or merit. Typical step-down language includes terms such as there: always, usually, some of the time, rarely, fully, adequately, partially, minimally, high or broad, adequate, limited, and very limited. Grids vs. No Grids: Some teachers want to explain their grading criteria to students but avoid the constraints of grids and specific descriptors that may seem overly positivist and prescriptive. Instead of specific descriptors for each criterion, this teacher simply presents each criterion as a question, leaving blank space in which to write brief comments explaining the student’s numerical score for each criterion. One of the last important sections of this article was how determining grades can worry a teacher and then effecting how they grade a paper. “Teachers who worry that low grades can affect students’ psyche, motivation, scholarship eligibility, or career options or who fear that low grades may influence student evaluations of their teachers are often satisfied with a lower bar” (Bean, 288). To have fairness and fewer worry feelings, the idea of grading papers before they know which student wrote it. By not knowing who wrote the paper, there is no room for bias. Purpose: Reflect upon ‘the teacher as writer” and describe how we see this concept and movement developing. We articulate a view of the teacher-writer as empowered advocate. Using examples from our scholarship, we illustrate how this powerful idea can transform research conducted about and with teachers. Finally, we draw attention to the potential of the teacher-writer stance as a means of resistance to current reform efforts that disempower teachers. Having the idea of reflecting on the history, present, and future status of teachers is a compelling thought and was well written by Anne Elrod Whitney. She presents three phases of the development of the teacher-writer. The writing process phase (the 1970s and 1980s): Promoted teachers as writers about process-oriented pedagogy and the rise of the writing workshop. The teacher research phase (the 1990s and 2000s): Writing about inquiry as a mode of professional development and generating useful knowledge. Currently, teachers as advocates and intellectuals: The context for teaching has been affected by privatization and standardization-forces that de-authorize teachers while emphasizing market forces as engines of educational innovation. Writing and teaching go hand in hand, which I believe can easily go unnoticed. Purpose: Comments create the motive for doing something different in the next draft; thoughtful comments create the motive for revising. Without comments from their teachers or from their peers, student writers will revise in a consistently narrow and predictable way. Without comments from readers, students assume that their writing has communicated their meaning and perceive no need for revising the substance of their text (Sommers, 149). Another look into the deep waters of commenting on students’ papers gave me another opportunity to see both sides of the spectrum, the teacher and the student. (Thank you to Nancy Sommers for another great read). As a current student, I connect with the points made in this article about what students go through when it comes to revising their papers. However, understanding a teacher’s difficulty of trying to have a student create the best work they can without steering them in the wrong direction and allowing them to lose focus on the purpose of their paper. In high school and my first writing courses in college, I felt that the papers I wrote were for my professors, not for my learning experience. If my paper pleased the teacher, then I would be satisfied and then get my “teacher pleased grade.” When I would have the classes where my professor gave me comments on my paper that made me want to revise and do my best, it felt like a holiday. After reading this article, I found that teachers just need to be reminded of how to properly comment on a student’s paper. (Very simple). Sommers presents research about how teachers and their comments on students’ papers change how they write. Since students follow the comments written on their papers, the errors may be fixed, but their papers are not improved and sometimes become worse when it comes to their second and third drafts, doing the opposite effect of revising. Another problem that Sommers emphasize is the use of vague language. “Choose precise language” or “think more about your audience” is a couple of examples that Sommers states are used when teachers comment on a student’s paper. She then claims this turns into a “guessing game” instead of a clear purpose of what needs to be changed and worked on. Below, I sketched out how I think comments should be made on different drafts. Of course, I still have a lot to learn when it comes to the teaching side of the table, but this article inspired me to create my own guide to future grading criteria for my students’ papers.